Chhath ki subhkamnai kare sweekar. All that exists was born from the sun there is nothing apart from it. Of what is and has been and is to be and what moves and remains still…. the sun alone is the source and the end… HappyChhathPuja !!!!!!!!! People worship god Sun for his kindness and seek forces of nature like sun and river. Women keeps strict fast on this day and worship God Sun during holy Bath into river! Happy Chhath! On this auspicious occasion, I wish the color, bliss and beauty Of this festival Be with you throughout the year! 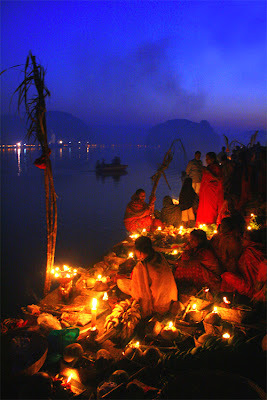 Happy Chhath! Long live the tradition of Hindu culture, as the generations have passed by, Hindu culture is getting stronger and stronger lets keep it up. Best Wishes for Chhath. On the day of Chhath Puja people goes to holy bath at river. They offer arghya to God Sun to thank for giving sunlight to earth. It maintains the balance of environment and help to growth of crops. Thodi hi sahi par baat hui!! Rista bana k rakhana bilkul mere jaisa hai!! !